Kobunboku is an expression of the Plum Tree.The flower is well known as " The flower of peace" from ancient China. Kobunboku is a wonderful mixture of Sandalwood & herbs, especially good for meditation and relaxation. Produces a delicate, spicy and sweet aroma. Baieido is considered to be one of the top three Incense companies in Japan and this is a premium product and best selling product of theirs. Also available in a 25 Stick box, 220 Stick box and 85 Long Stick versions. 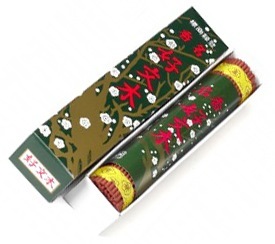 Please browse the Baieido Incense section of our shop.